“Syllogism” in Hindi means “युक्तिवाक्य” – a statement using tactics. It is an instance of a form of reasoning in which a conclusion is drawn (whether in a valid way or not) from two given or assumed propositions or premises, each of which shares a term with the conclusion, and shares a common term NOT PRESENT IN THE CONCLUSION (e.g., all dogs are animals; all animals have four legs; therefore all dogs have four legs). Moreover, modern usage distinguishes between valid syllogisms (the conclusions of which follow from their premises) and invalid syllogisms (the conclusions of which do not follow from their premises). From a formal point of view, a conclusion follows NECESSARILY from the premises. 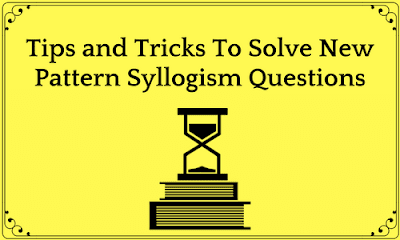 First and foremost have a quick glance at the main rules to solve Syllogism Problems. Go by the options. Each option might contain three sub-statements. First arrive at the conclusion from the first two sub-statements and check whether the same tallies with the given conclusion. If YES, proceed to the second and the third sub-statement to arrive at the second conclusion and if it also tallies with the conclusion given then that is the RIGHT OPTION. You need not check the other options. If NOT then proceed to the next option. 1. Some tulips are not lily. 2. Some flowers are roses. A) Some roses are not lily. All roses are tulips. All tulips are flower. B) All tulips are rose. Some lilies are not rose. Some tulips are flower. C) All rose are lily. No lily is tulip. No tulip is flower. From Option A, i) some roses are not lily. All roses are tulips. (First two sub-statements) See the Rule: Some + All = Some => Some tulips are not lily – Conclusion 1. ii) All+All = All => All roses are tulips. All tulips are flowers (last two sub-statements) = All roses are flowers = OR some flower are roses – Conclusion 2. Statement A is the right answer. One need not check the other options when one finds the correct option in the Examination Hall. Option B: All + Some = No Conclusion. This option is not valid. Option C: All + No = No. Conclusion comes that No tulips are lily which is contra to the conclusion 1. This option is not valid. Option D: Some + No = Some Not. The conclusion from the first two sub-statements arrived is that No rose is tulip and No tulip is rose which is not according to the conclusion given. 1. Some batteries are not chargers. 2. Some mobiles are not Sims. A) Some chargers are mobiles. No mobile is battery. All batteries are Sims. B) All chargers are mobile. Some Mobile is battery. All batteries are Sims. C) No charger is mobile. All mobile is battery. No battery is sim. D) No charger is mobile. No mobile is battery. All batteries are Sims. In Option C i) No+All = some not reversed => No charger is mobile. All mobile is battery. = Some batteries are not chargers – As per Conclusion 1. All+No = No => (as per the 2nd and 3rd sub-statements of Option C = All mobile is battery. No battery is sim. =No mobile is sim, and hence when no mobile is sim; and hence some mobiles are not Sims – as per Conclusion 2. C Option is the correct Answer. Some + No = Some Not which comes exactly to conclusion 1 after analysis of the first two statements i.e. some batteries are not chargers. But if we verify the second and the third sub-statements No + All = some not reversed which comes to some Sims are not mobiles but this is a quite reverse to conclusion 2. Hence this option is not right. All + Some = No Conclusion. Hence this option is not right. No + No = No Conclusion. Hence this option is not right.